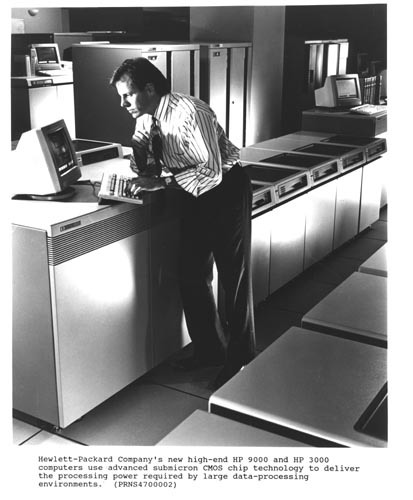 B&W image of HP9000 system with peripherals and monitors A man is leaning over a control unit with a keyboard and looking at a monitor. Label bottom " Hewlett-Packard Company's new high-end HP 9000 andf HP 3000 computers use adcvanced submicron CMOS chip technology to deliver the processing pwer required by large data-processing environments. (PRNS4700002)"